I don't know why you ever liked that guy! Oh! That is a lie! Well, no, it wasn't a lie. I escalated by betting him dinner on the matter. Then I explained to him that, since the truth of a proposition is a precondition for it to be known, one of the ways that I could not know why he'd ever liked Hitler would be if he'd never liked Hitler. Another way would be if I'd never believed that he'd liked Hitler, regardless of how my friend really felt about Hitler. was a truth (though perhaps not a simple truth, as he'd had trouble seeing it). Having won the wager, I waived the prize; my objectives in betting had all been met. Now, had he won the wager, then I'm sure that he'd have collected; but had I claimed, as he'd thought, that he'd once liked Hitler, then he'd have been quite justified in extracting the dinner; it would have disincentivized my insulting him in such a way, and off-set the felt sting of the calumny. That was how he spoke. He often began with Oh! , and when learning English in Hong Kong he had been taught to avoid contractions. (2015:09/24): I have edited the formal expression, seeking to have it capture more completely the structure of the natural-language expression. Everybody Draw Mohammed Day Is Here! Some people have chosen to draw caricatures, but my objective was simply to violate a grossly illegitimate prohibition. As such, I sought to draw Mohammed. If the death threats become more narrowly focussed on those who creäte caricatures, then I will creäte a caricature. We're taking a neutral position regarding the report we received, but if we continue to receive similar reports, we'll have to investigate. Policy violations can result in a formal warning, a temporary suspension, or an indefinite suspension. Well, I'd like to know about what message this complaint was levelled. But, naturally (this being eBay), there's no appropriate option at index_selection.html, and the best fitting options require that in one field I provide a relevant item number or user ID about whom I'm complaining. My own user ID is rejected from this field. Over the years, eBay, like many other corporations, has modified its interface and protocols to make them dumber in ways that specifically increase the difficulty of confronting it with responsibility. 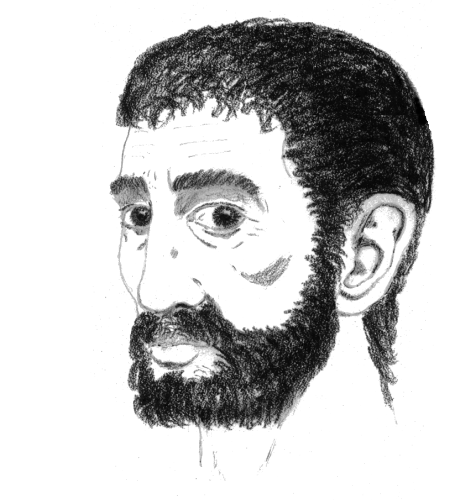 eBay was founded by Pierre Omidyar, whose user ID is pierre . So I entered that user ID in the field, and it was accepted. Doubtless that, if others do likewise, then the software will be tweaked to prevent it. On 27 July, at 11:30:10 PDT, seller posts item with an opening bid of $1.00 and some still unknown reserve price. 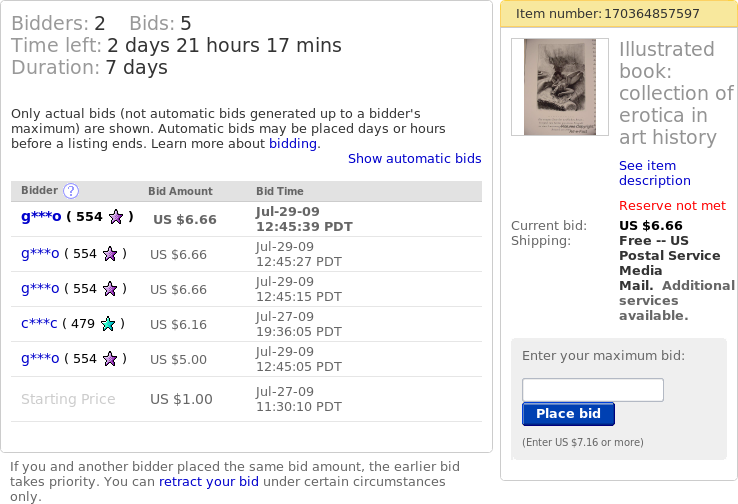 At 19:36:05 PDT, first bidder enters a maximum bid of $6.16; this does not meet reserve price, so first bid is $1.00. On 29 Jul, at 12:45:05 PDT, second bidder enters a maximum bid of $5.00; entry automatically pushes bid of first bidder to $5.50. 10 seconds later, second bidder enters some maximum bid more than 50¢ than first bidder's maximum bid, and finds that his or her bid is now $6.66. 12 seconds later, second bidder enters some higher maximum bid, but his or her bid remains $6.66. Another 12 seconds later, second bidder enters some even higher maximum bid, but his or her bid remains $6.66. If the second bidder were to enter a bid not less than the seller's reserve price, then his or her bid would become that. Otherwise, his or her bid will remain at $6.66 until some other bidder enters at least $7.16. each of which should be to a copy of the same video as that of the other two links. Some of you will recall my highly-localized tradition of anonymous Butterfinger bars. Last night, I went to the local CVS pharmacy and bought an eight-pack of Butterfinger Mini bars, took it home and gift-wrapped it, and then snuck it under the miniature Christmas tree on my neighbors' table. While at CVS pharmacy, I encountered Chris, who was despairing over an immediate lack of consumer choice. He had an urgent need to replace a mislaid umbrella. He had checked at the local Rite Aid and found none. At CVS pharmacy, his choices were amongst just two children's umbrellas, one with a race-car theme, the other a pink princess thing. Recognizing that the ironic charm of the latter would be quickly exhausted, he chose the former. My very best seasonal wishes to my friends who are reading this. As to the rest of you, I eye you with suspicion. Don't try nothin' funny! A man and woman who live in the same apartment complex as do I have a little table that they keep just outside the entrance to their unit. Last year, as Hallowe'en approached, they decorated the area in front of their apartment, and began leaving a bowl of candy in front of it, unattended, night-and-day. I bought a bag of small Butterfinger bars, and one night surreptitiously added them to the bowl. This act apparently disturbed someone, as the bowl was thereäfter taken-in at night, and returned sometime in the daylight, until Hallowe'en had passed. In December, they placed a small Christmas tree on the table. Early one morning, I slipped a gift-wrapped large Butterfinger bar under it. This season, they again put out the Hallowe'en decorations, and the bowl, but they take it in when they retire. I have been carrying-around another bag of small Butterfinger bars, hoping for a chance to add them undetected. But, repeatedly, when I have gone by their unit, the fellow has been sitting near the window, such that he might turn and look at an unfortunate moment. However, last night, the bowl was out and there seemed no one at the window. I grabbed three or four small bars — more bars would have taken more time — and added them to the bowl. Then I walked on towards the mailboxes. Seconds later, the man came round the corner, returning with their dog from a walk. I greeted the dog by name (I don't know the name of the man), but kept walking. Perhaps I am now a person of interest in their investigations. In any case, the bowl was not out when I returned late last night. Mr. Watson! Go there! They want you! While I was apparently distracted by shiny objects, Verizon Communications, Inc., spun-off its landline operations in Maine, New Hamsphire, and Vermont as Northern New England Spinco Inc., which was on the same day merged with FairPoint Communications, a firm previously noted for holding various small, rural local telephone operating companies. I have received a tiny amount of stock, and a tiny check in lieu of a fractional share. They have suggested that I might sell them the shares. Previously, Verizon spun-off Idearc Media Corp., and likewise sent a small check and a tiny number of shares. They actively encouraged me to sell-back the shares, but I decided to be difficult. I don't plan to sell-back the FairPoint shares either. It is interesting to see Verizon, which once aggressively absorbed other telephone companies, now spinning-off its landline operations in three states. When SBC Communications bought the remains of AT&T, and then took the name AT&T for itself, the media and others creäted the impression that the original AT&T, broken apart in the '80s, had been reässembled. (The Wikipedia article on the new AT&T uses a diagram designed as if to foster this misimpression.) In fact, some of the original RBOCs were not absorbed by SBC / AT&T, being instead held by Verizon and by Qwest Communications International, Inc. And now this consolidation into three parts has become a division into four parts.